Alice is a big fan of Miranda Sings, the You Tube personality. 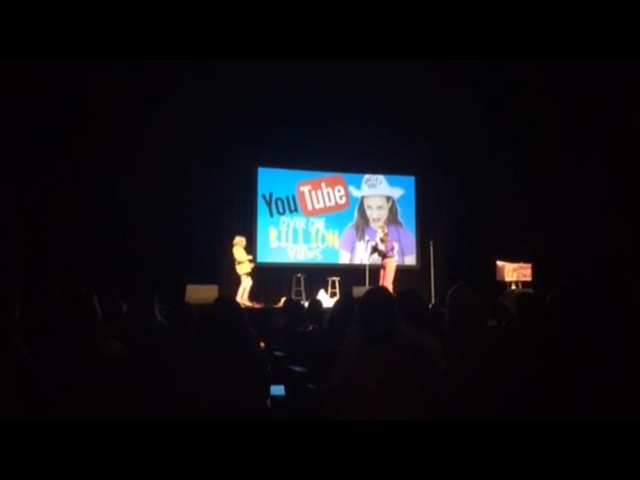 For her birthday this year, Alice asked to go to the Miranda Sings concert in San Antonio. 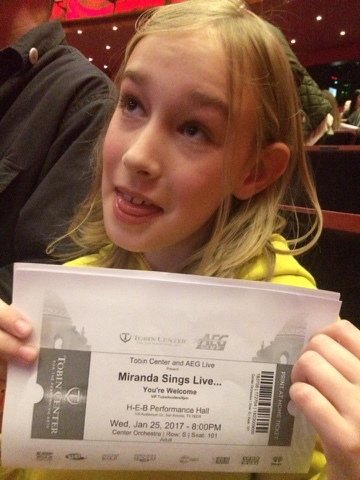 For weeks prior to the concert, Alice would talk about how she was going to get on stage to meet Miranda. As her mom, I tried to prepare her to enjoy the concert even if her dream of meeting her in person did not happen. We arrived at the Tobin Center (awesome venue by the way). We were in the mid orchestra section, which is pretty much in the middle of the seating for the floor. Good enough to see, but definitely not front row seating. During the show Alice yelled and screamed with the audience, danced in the aisle, and sang along with the show. Several times Miranda asked for volunteers to come up on stage to help out in a skit. Most of the time, Miranda picked someone from the first few rows, but each time she asked for volunteers, Alice would run down the aisle closer to the stage and try to get Miranda's attention. We thought for sure this tactic would not work, but didn't see the harm in her exuberance. Alice proceeded to be led on stage for a You Tube Challenge called 'Chubby Bunny'. The basic rules were each contestant (Miranda and Alice) would put a marshmallow in their mouth and say "chubby bunny" until one of them could not talk. Miranda's marshmallows were the small ones you put in hot chocolate, while the marshmallows she gave Alice were each the size of their fist. Hilarity ensues when Alice only has one marshmallow in her mouth and can't speak. 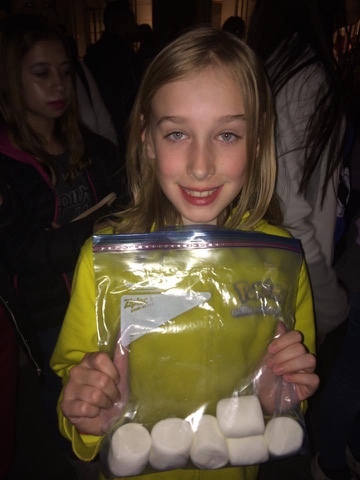 At the end, Alice got a hug from her You Tube hero, a bag full of giant marshmallows, and a memory to last a lifetime!